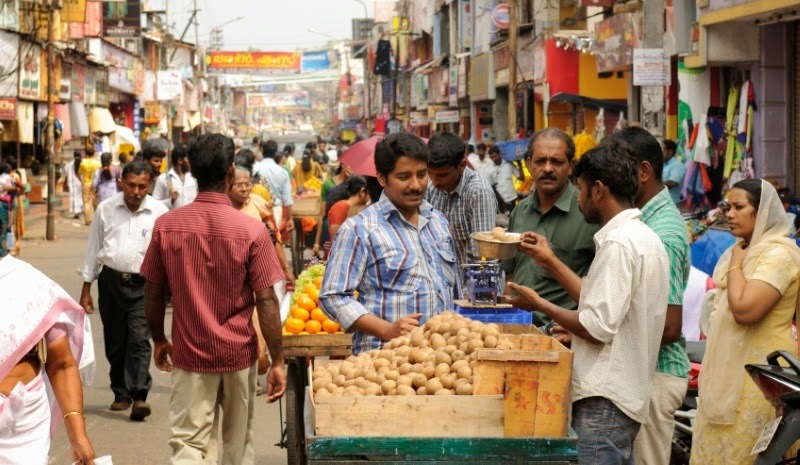 In pursuit to strengthen the mobile eco-system in India, Micromax, a smartphone manufacturer has announced a strategic partnership with MediaTek, the leading chipset manufacturer and Aircel, one of India’s leading telecom players. Aimed at offering the best out of the box experiences for the Indian users, the partnership will see a unique amalgamation of the expertise of the three companies. While Aircel will offer one stop solutions to address the increasing data demands, MediaTek along-with Micromax’s expertise in product design and performance will redefine the user experience creating a win-win ecosystem for the Indian users. 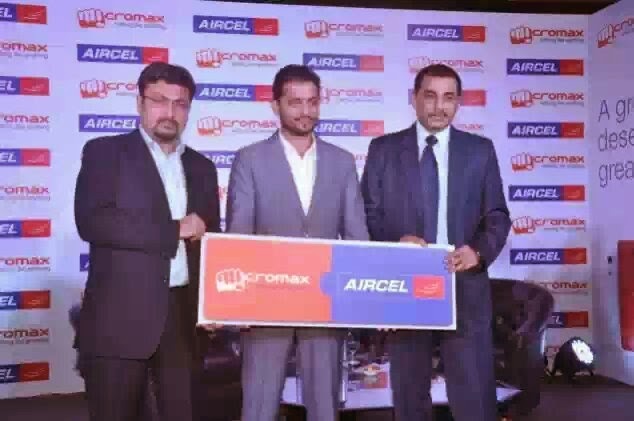 Under this unique alliance, Aircel will team up with Micromax to introduce a range of offers for the consumers which will be almost equivalent to cost of the device. Powered by MediaTek chipsets, the devices promise to deliver a seamless and a powerful user experience, while the bundled Aircel offers will drive data growth in the country. The offers initially will be available across 4 Micromax devices – MMX 377G, Funbook Mini 410i, A090 and X070. The co-developed smart devices by the three pioneers will deliver seamless experience for the consumers, driving enhanced performance and data experience for customers across the country. Commenting on the partnership, Vikas Jain, Co-founder, Micromax, said, “At Micromax, we have constantly strived to democratize technologies for the masses by bringing alive unique and customized products and offerings for our consumers. Entering a new phase, our focus is now to provide seamless solutions to the consumers using their smart devices, thereby concentrating a large chunk of our efforts on coming up with products and services which act as solutions to the needs of the fast-evolving consumers. This partnership exemplifies the same endeavor, and we are very delighted to pioneer with MediaTek and Aircel, two pioneers in their own respective domains. Polaris Financial Technology Ltd, a leading firm in products, solutions and services that enable unprecedented operational productivity for the global Financial Services industry, announced the demerger of its Products (Intellect) business into an independent entity. The company will be filing the Scheme of Demerger with the Stock Exchanges, SEBI and High Court as per extant regulations. After demerger and subject to approval from regulatory authorities and shareholders, the Product Company will be known as Intellect Design Arena Ltd (Intellect) and comprise of four distinct businesses : Global Universal Banking; Risk and Treasury Management; Global Transaction Banking and Insurance. Polaris Financial Technology Ltd (Polaris) will continue to run the Services Business with a strong vertical and solution focus. As consideration for the Demerger (technically called a Vertical Split), every shareholder of Polaris Financial Technology Limited, will receive one share of Intellect. The Product business is significantly different from the Services stream, in terms of investments into product development, talent and sales & distribution. 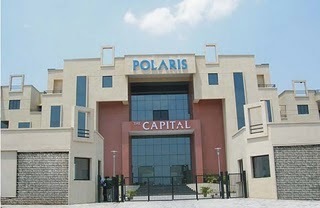 Given this, the Polaris Board, taking into consideration the recommendations made by the Special Committee comprising of independent directors of the Board as well as the Audit Committee, has decided to offer a special option to the shareholders of Intellect to exchange the shares (should they wish to) allotted pursuant to the Demerger against fully secured non-convertible debentures (NCD). These NCDs shall have a face value of Rs.42 , with a coupon of 7.75% p.a., redeemable at par after 90 days. 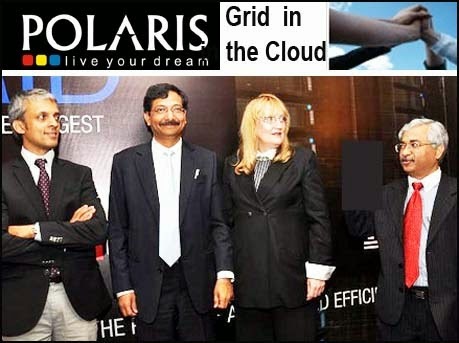 The company announced the next phase of its growth journey, i.e., Polaris 4.0, as the culmination of its annual visioning exercise (Lakshya) in Jan 2012. Since then, the company has taken measured steps in four stages that led to the decision to de-merge. Stage 1 (January - June 2012) involved identifying major opportunities and the constraints in leveraging them. 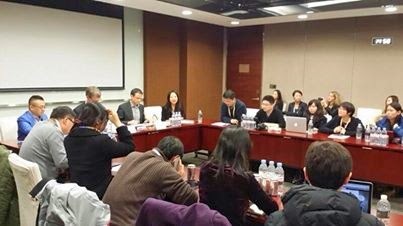 Stage 2 (July - December 2012), focussed on Strategy design, anchored by the Polaris Board and Boston Consulting Group (BCG). In Stage 3 (January - June 2013), a special Task Force was set up internally to work on the Change Design. Between July 2013 and January 2014 (Stage 4), the business of the company was re-organised into distinct Services and Products businesses, with independent CEOs. Arun Jain, Executive Chairman, Polaris Financial Technology Ltd. said, “This is a decisive step towards unlocking the potential of the company to respond to emerging opportunities in Financial Technologies in the coming decade. In fact, it is a win-win for customers, employees and investors alike. From a customer perspective, this new structure aligns investments, competencies, decision making and processes to drive the next level of value creation. On one side, the customer will be able to enjoy deeper focus for his specific needs, say Services, while he would be able to accelerate his change-the-business agenda with truly next-gen Products. From an employee perspective, alignment to their individual talent and interests will become a lot sharper, opening up clear streams for career advancement. From an investor perspective, on one hand, the shareholder will get an additional share of Intellect, a new horizon business. On the other hand, expanded leadership capacity, greater customer centricity and sharper focus will drive higher value in each of the Businesses. " As announced at the time of restructuring, Jitin Goyal will continue as Chief Executive Officer of the Services business, and will be based in London. In the Products entity, Manish Maakan will continue as Chief Executive Officer of the Intellect Global Transaction Banking (iGTB) business operating out of London; Jaideep Billa and Venkatesh Srinivasan will continue to be Joint Chief Executive Officers of Intellect Global Universal Banking and Intellect Risk & Treasury business, operating out of Singapore and Mumbai respectively; and Pranav Pasricha will continue to be Chief Executive Officer of the Intellect Insurance product business, based in New York. Polaris Holdings Pvt. Ltd., whose name has been changed to Polaris Banyan Holding Pvt. Ltd., will continue to be the promoter of both the companies. Both companies therefore will operate as Polaris Group Companies, each with its independent management team and Board of Directors. Arbor Networks, Inc., a leading provider of DDoS and advanced threat protection solutions for enterprise and service provider networks has announced the results of a survey it sponsored with the Economist Intelligence Unit on the issue of incident response preparedness. The Economist Intelligence Unit surveyed 360 senior business leaders, the majority of whom (73%) are C-level management or board members from across the world, with 31% based in North America, 36% in Europe and 29% in Asia-Pacific. The report entitled “Cyber incident response: Are business leaders ready?” shows that despite 77 percent of companies suffering an incident in the past two years, over a third of firms (38 percent) still have no incident response plan in place should an incident occur. Only 17 percent of businesses globally are fully prepared for an online security incident. More prepared firms that do have a response plan in place typically rely on the IT department to lead this process, but the majority also draw upon external resources – primarily IT forensic experts, specialist legal advisers and law enforcement experts. 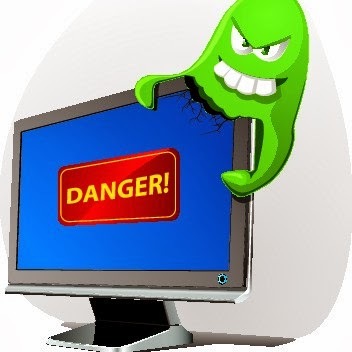 “There is an encouraging trend towards formalizing corporate incident response preparations. But with the source and impact of threats becoming harder to predict, executives should make sure that incident response becomes an organizational reflex rather than just a plan pulled down off the shelf,” said James Chambers, a senior editor at The Economist Intelligence Unit. * Only 17 percent of business leaders feel fully prepared for an incident. * 41 percent of business leaders feel a better understanding of potential threats would help them be better prepared. * Having a formal plan or team in place has a significant effect on feeling of preparedness among executives. * Half of all companies feel that they are unable to predict the business impact when a breach occurs. * Two-thirds of executives say that responding effectively to an incident can enhance their firm’s reputation. * The percentage of organisations that now have an incident response team and plan in place is set to rise above 80 percent in the next few years. * Firms that have suffered an incident in the past 24 months are twice as likely to have an arrangement with a third party expert as firms that have not suffered an incident. * 57 percent of organisations do not voluntarily report incidents where they are not legally required to do so. * Only a third of companies share information about incidents with other organisations to spread best practice and benchmark their own response. 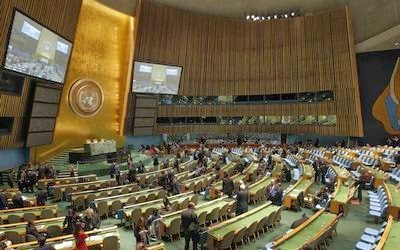 Why Multiple Technologies Failed To Locate Malaysia Airlines MH370 Flight? Authorities are still struggling – nearly one week later – with how Malaysia Airlines flight MH370 vanished about an hour after takeoff on a flight from Kuala Lumpur to Beijing, with 239 passengers and crew. Airliners follow standard “airways” that define preferred routes between key points, and are tracked along the way by air traffic control (ATC) via position reporting by VHF radio, and by radar. ATC radar has two ways of working: “passive” radar, in which the ground station simply sends a pulse and calculates distance by the time for the echo to bounce off the aircraft; and active, where the aircraft’s “transponder” sends its own signal each time it detects an incoming radar pulse. The transponder signal contains a four-digit code that uniquely identifies the aircraft with its altitude and position on the ATC display. Further radar monitoring is generally performed by the military. But modern aircraft such as this have several other communication systems. These include the Aircraft Communications Addressing and Reporting System (ACARS), a data reporting system using the Inmarsat satellite network, and the Rolls Royce engine data system, a key innovation by the British jet engine manufacturer. During flight diagnostic, information on the aircraft’s two Trent 800 engines, such as temperatures or oil pressure, is collected and transmitted in bursts via the satellite system back to Rolls Royce’s 24 hour monitoring centre in Derby. While not replacing the on-board cockpit instrumentation, this system is able to monitor 3,000 engines in real-time to interpret trends in engine parameters, which helps the company deliver improved maintenance to airlines and better plan availability of parts and replacements. Rolls Royce claims that the growing sophistication of these predictive maintenance tools has resulted in increased capability for potential technical issues to be caught before they become disruptive and costly problems for the airline. However, these multiple communication systems have so far failed to give a clear indication of the whereabouts of the plane. Officials said the plane's data reporting system shut down at 1:07am on Saturday, while the transponder transmitting location and altitude shut down at 1:21am. They now believe that the plane could have flown for several hours beyond the last transponder reading. With two separate communications systems stopping only 14 minutes apart, "this is beginning to come together to say that...this had to have been some sort of deliberate act [and not a catastrophic failure]”, ABC News aviation analyst John Nance told CNN. In the event of a crash, there is an Emergency Location Transmitter (ELT) that sends a distress signal automatically upon immersion in fresh or salt water. 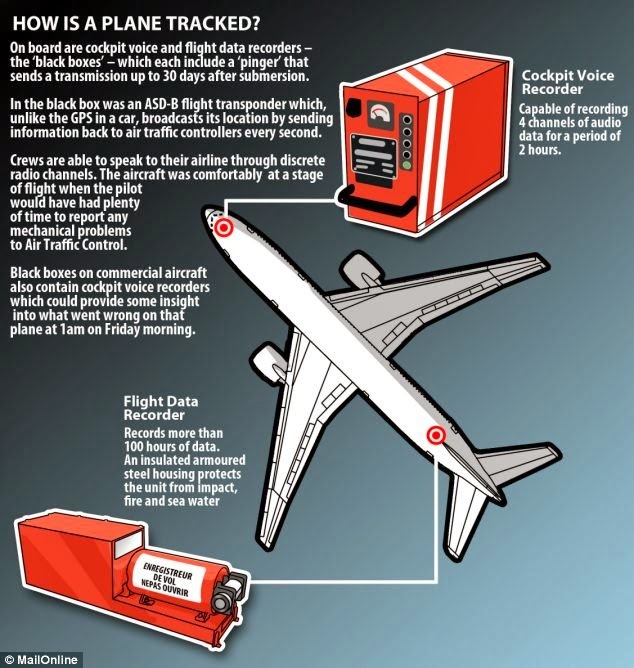 Then there is the “Black Box” recorder (actually orange) located in the tail of the aircraft, which is designed to survive a crash and immersion, and send its own emergency locator signal. However, neither signal was received, and the failure of the beacons to activate could mean that the plane didn't crash, that the transmitter malfunctioned, or that it is underwater somewhere (it must remain on the surface for a distress signal to transmit). There is considerable confusion on how to interpret the various signals that were received from MH370. The Wall Street Journal reported that the aircraft continued to send “pings” (saying “I'm here, I'm ready to send data") to the Inmarsat satellites for up to four hours after its last transponder position. The WSJ said that these confirmed that the plane was moving, and the final ping was sent from over water at what was described as a normal cruising altitude. It added that it was unclear why the pings stopped. One industry official said it was possible that someone on board had disabled the system sending them. However, Rolls Royce has denied reports that the jetliner was sending engine data for some five hours after it lost contact with the main control tower. The Malaysian government also denied this report, as did a senior aviation source, who also said that there was no technical data suggesting the airplane continued flying for four hours, and said specifically that the WSJ account was wrong. It seem likely that the ACARS system was continuing to ping the satellites to maintain contact, but that no data (particularly from the engines) was sent. It is extraordinary – in this age of the Internet of Things – that modern technology has so far failed to locate the Malaysian airliner, and that for up to five hours after the ATC lost contact nobody knows if it was still flying or not. The search radius in this case is determined, in the absence of better information, purely by the maximum distance the fuel on board enables the plane to fly – hardly much of an advance in the last 50 years. And our failure to detect any problem earlier has thus vastly increased the search area and thereby reduced the probability of successfully locating the aircraft. Despite having multiple systems that use different communication methods, there are no clear conclusions that can be drawn from their content. Despite their sophistication, these different systems were never designed to work together, and so they present a challenge to the task of constructing a “joined-up” picture of events. Furthermore, most were also designed in a different era – making many of the on-board systems vulnerable to being intentionally disabled by a hijacker, and rendering the aircraft practically invisible to the authorities. 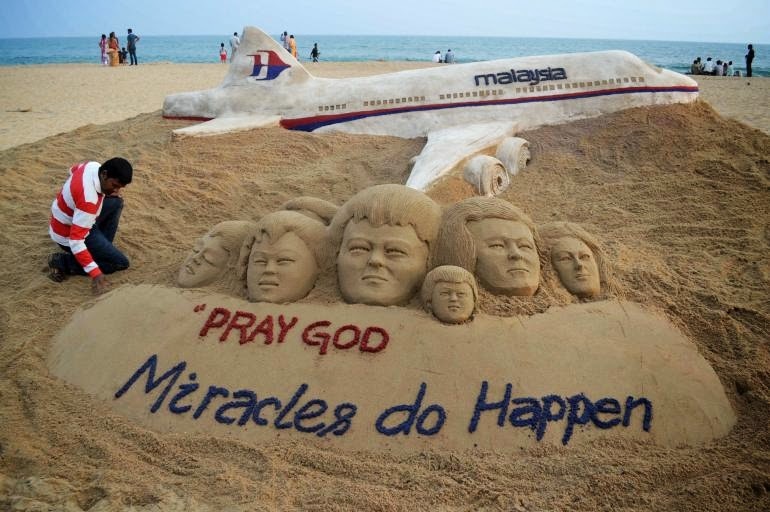 Whatever the conclusion to the mystery of MH370, let us hope that this incident may provide a spur to the aviation authorities and equipment manufacturers to accelerate the development of new systems that provide a more integrated, robust and secure approach to monitor commercial flights. 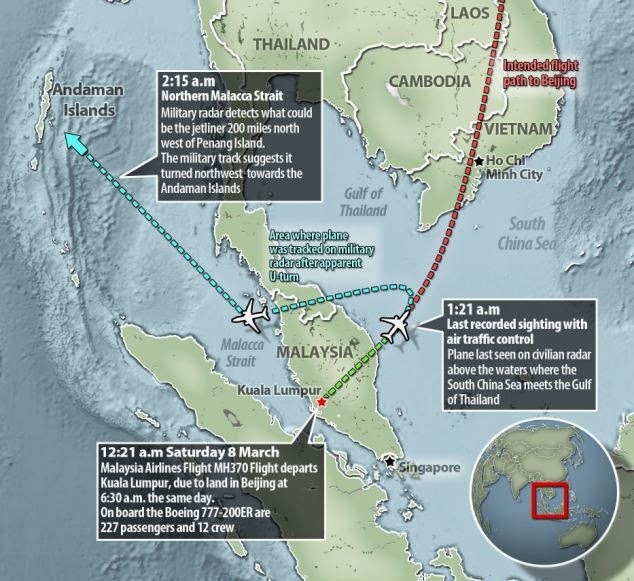 Here are some more theories on what could have happened to the MH370 flight. SAP AG has announced a new global program that aims to provide comprehensive support for students who want to start businesses that develop real-time solutions and Big Data applications. Participants in the entrepreneurship program will receive support in developing new applications on the SAP HANA platform. The students will be able to use SAP software free of charge to develop applications and will be assisted by SAP experts. A comprehensive training program will provide the necessary technical background on SAP HANA as well as SAP® Mobile Platform. Students will also be trained in design thinking methodology to help them along the process from an idea through to the finished product. Once students have set up their business, they can participate in the SAP Startup Focus program and receive free-of-charge technical support, consulting and marketing services from SAP. The company will also assist with the market launch, provide access to the SAP partner network and offer opportunities to participate or hold presentations at events organized by SAP or other manufacturers. To open up new sources of funding, young entrepreneurs will receive access to SAP Ventures, the independent venture capital firm affiliated with SAP, and other venture capital companies. 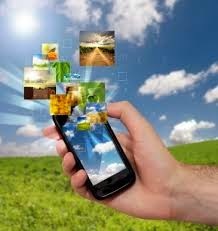 SAP plans to roll out the program first in Europe and later in Asia and the U.S., and aims to win 100 universities as partners by the end of 2014. Leading universities worldwide have already expressed interest in supporting 10,000 potential student entrepreneurs as multipliers and by developing relevant curricula. The new entrepreneurship program is part of the SAP University Alliances program, a global initiative with nearly 1,500 member institutions in more than 80 countries. SAP University Alliances is aimed at universities and vocational schools that want to actively integrate SAP software into their teaching. SAP promotes real-life, future-oriented training through the program by making the latest SAP technology available to lecturers and students worldwide. 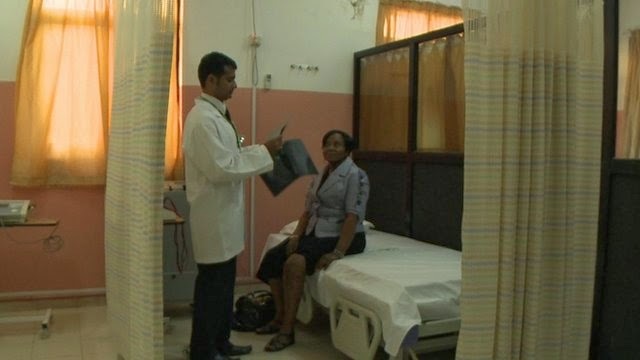 The International Telecommunication Union (ITU), a UN agency focusing on the information and communication technologies, has offered its first stage approval to an important standard enabling an exchange of multimedia health data between health provider, a controlling function and patient. According to e-Health experts in ITU, a combination of a common data definition with connectivity across different systems – ranging from the personal health and point-of-care devices described in Recommendation ITU-T H.810 to a range of health management back-ends – will provide simple, secure and scalable interoperability. The development of Recommendation ITU-T H.860, Multimedia e-health data exchange services: Architecture, services and data dictionary was led by ITU Member Platform Health, a non-profit organisation, based on successful reference implementations in a range of countries in the Middle East, Asia and Africa. The common health schema of Recommendation ITU-T H.860 is applicable to a wide spectrum of diseases (non-communicable, communicable, maternal/child, trauma, etc. 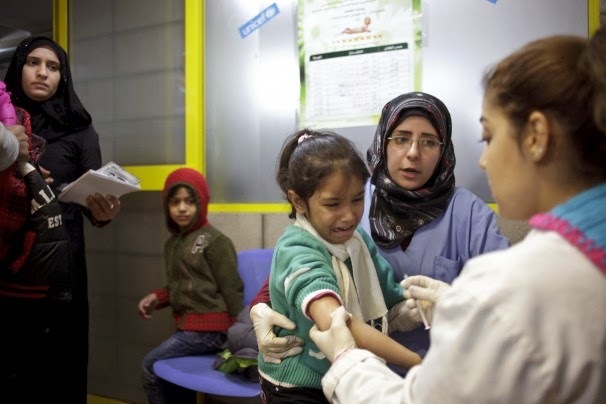 ), interventions (preventive, curative, palliative), and health IT systems (from simple standalone, to integrated care, web services and mobile applications). 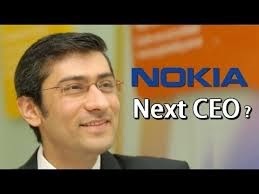 Will Rajeev Suri Succeed As Nokia's Next CEO? Rajeev Suri, the head of Nokia's telecoms network equipment division, is likely to become the Finnish group's next chief executive following the sale of its handset business to Microsoft , a newspaper report said recently. Helsingin Sanomat newspaper, citing sources familiar with board discussions, said Suri was the strongest candidate to succeed Stephen Elop who is due to move to Microsoft once the 5.4 billion euro ($7.5 billion) handset deal is closed. The companies have been expecting to finalise the deal by the end of March, and the newspaper said the board of Nokia would nominate a new chief executive shortly after that. Indian-born Suri has been widely considered the leading candidate for the post as in recent years he has helped the network equipment division, Nokia Solutions and Networks (NSN), turn profitable with a drastic restructuring plan and by ditching unprofitable businesses. However, NSN recently reported its fourth-quarter sales fell 22 per cent from a year earlier, raising concerns about its growth prospects. NSN, which was originally a joint venture of Nokia and Siemens, accounts for about 90 per cent of Nokia's sales after the handset deal. Nokia declined to comment on the CEO selection process. Since last autumn, the company has been temporarily led by chief financial officer Timo Ihamuotila. 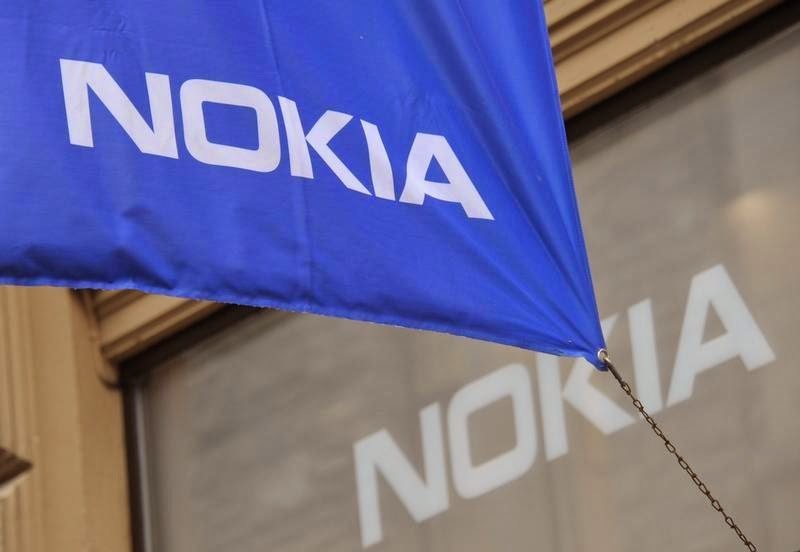 "We will talk more about the Nokia strategy, structure and organisation around the closing of the pending transaction," said spokeswoman Maija Taimi. IT firm CA Technologies said it has set up a new centre in Bangalore for developing differentiated, next generation solutions in emerging technologies. The new facility, which complements CA Technology's centre in Hyderabad, will focus on organic innovation in emerging technologies like mobility, digital payments, Big Data, data science/advanced analytics, it said in a statement. It has a floor area of approximately 50,000 sq ft and will house more than 400 employees, including engineers and developers. The centre will tap into the talent base in Bangalore to further the development of differentiated, next generation solutions in emerging technologies, the statement added. Organic innovation is at the heart of CA and the new Center will enable greater collaboration and faster product development across a wide range of emerging technologies, CA Technologies General Manager (New Business Innovation) Ram Varadarajan said. "Along with our centre in Hyderabad, we are making important investments in research and development in India to tap into the 'world-class' talent available in this market," he said. 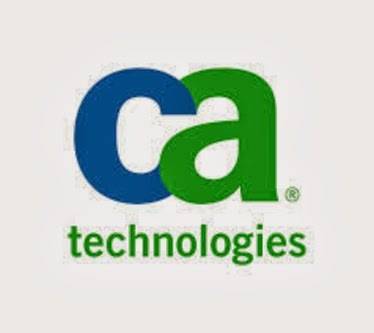 CA Technologies recently set up a centre in Santa Clara, in the heart of Silicon Valley. The work done by development teams in Santa Clara and Bangalore contributed to the recent launch of CA's Management Cloud for Mobility.